Former airline shareholder's $55 mln lawsuit to be handled on June 5 | Russian Legal Information Agency (RAPSI). MOSCOW, May 2 - RAPSI, Sergei Feklyunin. The Moscow Commercial Court will hold on June 5 the preliminary hearing in the lawsuit filed by former Transaero shareholder Eskerkhan Mutalibov on April 3. He is seeking $55 million. Registrars Reestr and Computershare Registrar are involved as co-defendants. The Russian Legal Information Agency (RAPSI/rapsinews.ru) has yet to reach the parties for comment. According to the Transaero shareholders list, Mutalibov held five percent of the shares in the airline as of May 2003. However, he was absent from the list prepared for the next annual shareholders meeting in May 2004. Mutalibov's statement of claim reportedly states that he has neither sold his shares, nor signed sale documents. He also has not received any money for the shares. 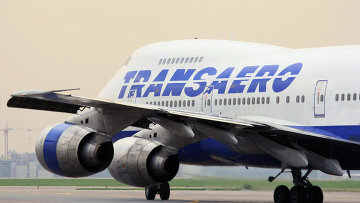 Transaero was established in 1990. It has a fleet of 76 aircraft. It operates flights to over 160 destinations in Russia, Europe, Asia, the Americas and Africa. Transaero's stock has been traded on MICEX since March 29, 2011. Alexander and Olga Pleshakov directly control 43 percent of its shares. Head of the Interstate Aviation Committee Tatyana Adonina holds a three percent stake, Lev Khasis owns 6.48 percent and Transaero-Finances owns 4.23 percent of the company. According to Russian Accounting Principles, Transaero's net profit more than tripled in 2011 to 1.83 billion rubles ($62 million). 16:21 02/05/2012 The Moscow Commercial Court will hold on June 5 the preliminary hearing in the lawsuit filed by former Transaero shareholder Eskerkhan Mutalibov on April 3. He is seeking $55 million.